London, April 25th, 2018 – EFFPAC RCT 12-month outstanding results with Luminor DCB have been revealed at CX Symposium 2018. The 12-month results from the full clinical cohort of the EFFPAC randomized controlled trial (RCT), were presented for the first time at CX Symposium 2018 at the DCB session on April 24th. 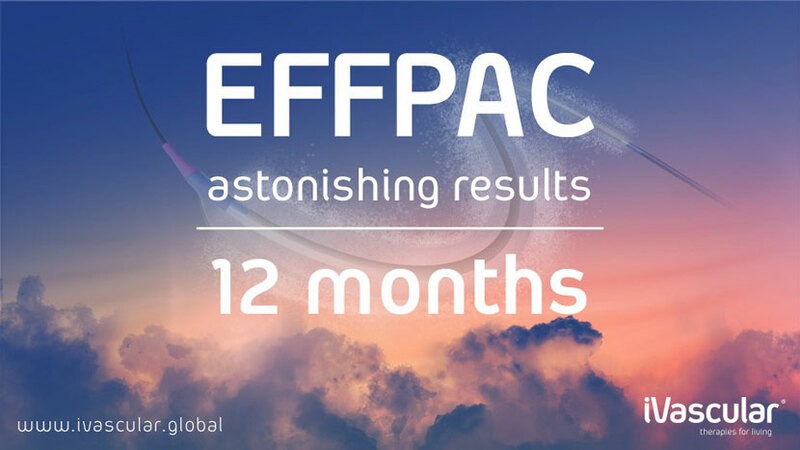 “We are very happy about EFFPAC 12-month outcomes, which are confirming that Luminor superior efficacy is maintained over time” said Lluis Duocastella, CEO of iVascular SLU. Luminor is a paclitaxel coated balloon with an innovative and proprietary coating, using unique nanotechnology for minimized drug loss during navigation and enhanced delivery to the artery wall. Full range, is available with 0.014”, 0.018” and 0.035” guidewire compatibility, providing ultra-low profile and fast deflation time. Transfertech is a proprietary technology of iVascular for the coating of drug eluting balloons. It has the capability of applying a uniform dosage of the drug by ultrasonic depositions of uniform diameter nanodrops.